Richard Holdsworth has enjoyed several lives! Hardly an exemplary scholar, Richard scraped through his 11 plus but came top at milking cows and driving tractors for the Squire in Bumblethorpe - the village at the centre of Six Spoons of Sugar. At 20, with Agricultural College behind him, Richard worked his passage on a cargo ship taking stud cattle to Australia. In the Outback he worked on Keynton Station, brought out the Supreme Champion bull at the Royal Adelaide Show, became a journalist with the Stock and Station Journal, and later joined the Melbourne Herald and Weekly Times where he met Heather, his Australian wife to be. Back in Britain they built their own Volkswagen camper, explored every nook and cranny around Europe, borrowed £150 from the Midland Bank, and set up a fledgling business building campers that eventually took top honours and sold worldwide. After selling the business in 1995, Richard went on to design and consult for major UK motorhome manufacturers and he established a leading German manufacturer on the UK market. 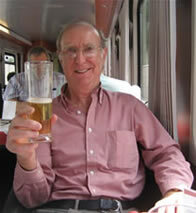 In between times he preserved one of the last locomotives built in the GWR Swindon works. Richard wanted to tell the story of the war through the eyes of a little boy snatched from the leafy suburbs of South London to a country village in the depths of Berkshire. Named after his Father’s hero, German composer Richard Wagner, he was always going to be treated with suspicion by the village kids and there were more bad days than good. Extracts from Six Spoons have come second (twice) in the prestigious Lifewriting competition sponsored by the Queen’s English Society at Winchester Writers’ Conference while Richard’s articles regularly appear in National leisure magazines. 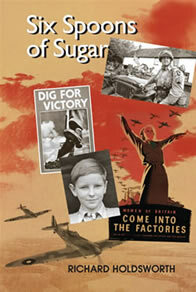 Readers of Richard’s evacuee book – Six Spoons of Sugar – have asked what happened next? 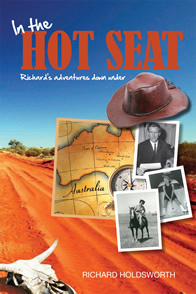 Here it is – In the HOT SEAT, Richard’s adventures Down Under and such adventures that they just had to be put down in writing. From the vast open spaces of the Outback to the sophisticated life of the cities, you would be hard pressed to find anyone who hasn’t got a fascination for Australia. And Richard saw and lived so much of it; he lived life on the edge some of the time and broke the rules most of the time – but usually came up a winner! It makes a great story and the Appendix brings the reader right up-to-date with Australia today with details that invite the intending traveller to start planning their very own trip right now. Read In the HOT SEAT and few will fail to get inspired – whether a visitor to this great country or an Aussie resident wishing to explore more. Now that Richard lives in Australia, In the HOT SEAT makes even better reading!